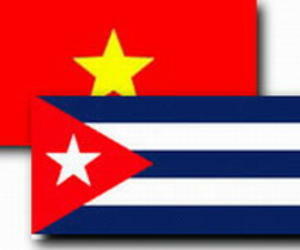 Representatives of Vietnam and Cuba exchanged experiences and views today toward the enhancement of existing cooperation in the biotechnology and pharmaceutical industries, with promising prospects on the horizon. After opening a bilateral seminar for the sector here, Doan Duy Khuong, vice president of the Chamber of Commerce and Industry of Vietnam, highlighted Cuba's strength, whose medicines are internationally recognized and are environmentally friendly. On the other hand, the general director of the VABIOTECH 1 company, Do Tuan Dat, referred to the development of ties and joint actions with the Finlay Vaccine Institute and the Havana-based Center for Genetic Engineering and Biotechnology. The Vietnamese official stated that his country is coordinating the registration, importation and marketing of certain vaccines, such as meningococcal type B and C, and the Quimi-Hib, with a view to a more advanced production phase in the future. Dr. Lazaro Gil, of the Cuban Center for Genetic Engineering and Biotechnology, gave a detailed account of his achievements and products generated, some of which have helped to prevent 26 diseases, as of the three guidelines that are human health, animal health, and sustainable development. The seminar was jointly organized by the Chamber of Commerce and Industry of Vietnam and the Cuban commercial office in Hanoi.